Comprehensive torque offering (18 in-lbs to 360 in-lbs), with direct coupled, linear or rotary actuators that can handle many applications. 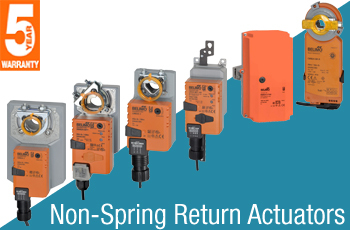 All non-spring return actuators use brushless DC motor technology, which is controlled by an Application Specific Integrated Circuit (ASIC). 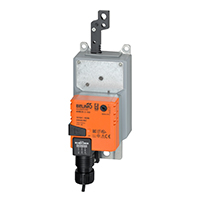 Minimum torque guaranteed over entire specified operating range; no loss in performance due to temperature, supply voltage or speed. Electronically protected against overload. Low power consumption provides higher efficiency and smaller transformer sizing. Comprehensive torque offering (22 in-lbs to 270 in-lbs) over a vast selection of actuators for a wide range of applications. True mechanical spring return, providing reliable fail-safe. Manual override crank eases installation (all EF, AF and NF series only). Low power consumption provides higher efficiency and smaller transformer sizing. 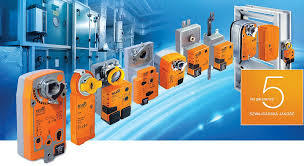 Minimum torque guaranteed over entire specified operating range, no loss in performance due to temperature or supply voltage. 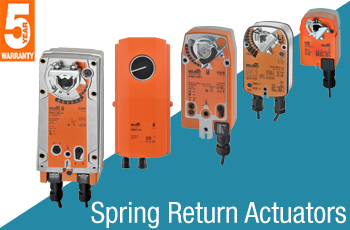 MFT is available in all spring return actuators, giving the user the flexibility to customize and adapt a single actuator to various controllers and applications.